When Batman goes missing, it will take the entire Bat “family” – including new additions Batwoman and Batwing – to keep the peace in Gotham City and unravel the mystery behind the Dark Knight’s disappearance in Batman: Bad Blood. Produced by Warner Bros. Animation and DC Entertainment, the all-new DC Universe Original Movie will be available from Warner Bros. Home Entertainment on February 2, 2016 on Blu-Ray™ Deluxe Edition, Blu-Ray Combo Pack and DVD. 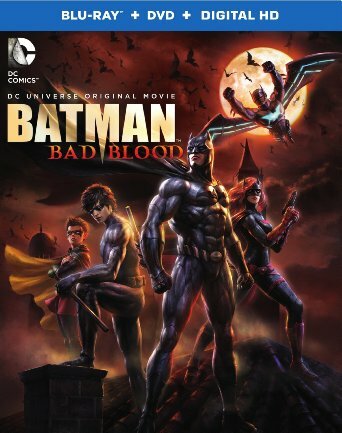 Batman: Bad Blood will be available on Blu-ray Deluxe Edition for $29.96 SRP, Blu-ray Combo Pack for $24.98 SRP and on DVD for $19.98 SRP. The Blu-ray Combo Pack includes a digital version of the movie on Digital HD with UltraViolet. The Blu-ray Deluxe Edition will include the Blu-Ray™ Combo Pack, along with an exclusive Nightwing figurine in a numbered limited edition gift set. Fans can also own Batman: Bad Blood in Digital HD on January 19 via purchase from digital retailers. As the voice of Batman, Jason O’Mara (Complications, Terra Nova) leads a celebrity-laden cast that includes Yvonne Strahovski (Chuck, 24, The Astronauts Wives Club) as Batwoman/Katherine Kane, Morena Baccarin (Homeland, Gotham) as Talia al Ghul, Sean Maher (Firefly, Serenity, Much Ado About Nothing) as Nightwing, Gaius Charles (Grey’s Anatomy, Friday Night Lights) as Batwing, Ernie Hudson (Ghostbusters) as Lucius Fox, and Stuart Allan (Batman vs. Robin) as Robin/Damian Wayne. An exclusive sneak peek at the next DC UniverseOriginal Movie, Justice League vs. Teen Titans. Featurette – “Putting the Fight in theGotham” – Batman is the world’s greatest detective, but he is also a formidable fighter. This documentary reveals the magic and strategy behind some of the best-choreographed fights in the latest animated film offering, Batman: Bad Blood. CHiPs: The Complete Fourth Season – California’s favorite motorcycle highway patrolmen are back!